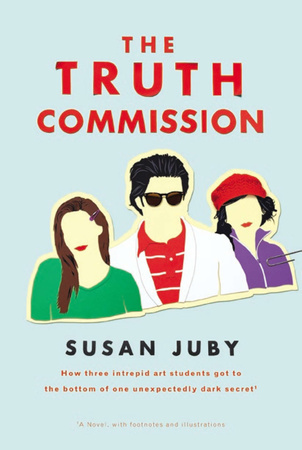 The Truth Commission – Rarely Pure, and Never Simple. First up, I will state the obvious – this is not a mystery story. While mysteries are my favorite genre, I do venture outside the norm occasionally and experience something else. That being said, the non-mysteries I find myself attracted to typically have some kind of mystery element going on within their pages. The Truth Commission is one of these. The book started out a bit slow. Normandy is setting the scene. It turns out the novel in your hands is a piece of “creative nonfiction” that Normandy is writing as a project for her junior year of high school. In the beginning there were a lot of footnotes, which I found distracting. The YA reader (to whom this book is geared towards) may not. Besides the amount of footnotes – which do lessen as the chapters go on – I liked the perspective of the book and the way the story is told through her project. Once Normandy turns the questions and the truth discovery onto herself, things really start to get interesting. As Oscar Wilde says in one of my favorite plays The Importance of Being Earnest, “The truth is rarely pure and never simple.” As Normandy begins to peel the onion away to get to her sister’s truth, she discovers how accurate Mr. Wilde’s statement is. This was a fun young adult novel with interesting characters. Not everything ties up neatly into a bow at the end, which felt right. Thanks to the First to Read program for providing me with an advanced copy of this book in exchange for an honest review. The quote in this post comes from the copy I received, which was uncorrected text.